Robert Gaston, M.D., professor emeritus in the Division of Nephrology, received the distinguished lifetime achievement award from the American Society of Transplantation at a special awards ceremony. This is the AST’s most prestigious award and honors a senior investigator who has made significant contributions to the field of transplantation. 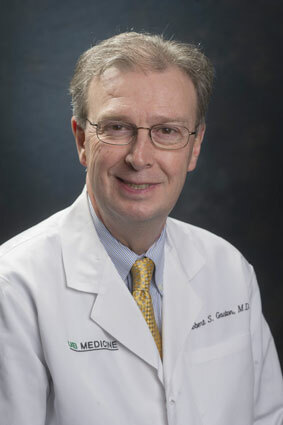 Among many responsibilities during a 30-year career at UAB, Gaston was medical director of the kidney and pancreas transplant programs from 2003-15, and interim division director of Nephrology in 2013. A consummate physician, researcher and teacher, Gaston was co-founder of UAB’s Comprehensive Transplant Institute in 2011, and he became the inaugural holder of the Robert G. Luke Endowed Chair in Transplant Nephrology in 2013. Gaston’s broad experience in hypertension, immunology, public policy and solid organ transplantation included research funded by the NIH, foundations and industry, with publication of more than 300 articles, book chapters, and abstracts. His expertise contributed significantly to increasing access to transplantation for minority patients and development of several treatments now essential to successful transplantation worldwide. Gaston expressed that his greatest professional highlights are having helped train more than100 nephrology and transplant fellows and having served more than 6,000 patients who received kidney and/or pancreas transplants at UAB during his tenure.